KLEMPKA, R. , WARADZYN, Z. , SKALA, A. A continuous development of technology involves a permanent improvement of appliances towards the increase in energy effectiveness, efficiency and precision of operation. This applies also to induction heating equipment. In order to increase the energy effectiveness of the inverter presented in this paper and limit its switching losses, its operating point has been optimized, which required solving a system of two non-linear equations. Due to the complex surface optimization to determine the optimal operating point, a modified firefly algorithm was used, which belongs to the family of intelligent optimization methods. An analysis of the effectiveness of optimization process was carried out, due to the firefly algorithm parameters. A modification of the firefly algorithm was proposed to speed up the optimization and get certainty of finding the global optimum. Theoretical outcomes were compared with the measured experimental results obtained in a real inverter system. H. Omori, H. Yamashita, M. Nakaoka, and T. Maruhashi, "A novel type induction-heating single-ended resonant inverter using new bipolar Darlington-Transistor," IEEE Power Electronics Specialist Conference, Toulouse, 1985, pp. 590-599. H. Yamashita, K. Asada, H. Omori, and H. Kominami, "An induction heating single ended push-pull resonant inverter using IGBT," in Proc. of the First International PCIM88 Conf., Tokyo, 1988. pp. 82-90. I. Hirota, H. Omori, and M. Nakaoka, "Performance evaluations of single-ended quasi-load resonant inverter incorporating advanced-2nd generation IGBT for soft switching," Intern. Conf. on Industrial Electronics Control Instrumentation and Automation, San Diego, 1992, pp. 223-228. S. Wang, K. Izaki, I. Hirota, H. Yamashita, H. Omori, and M. Nakaoka, "Induction-heated cooking appliance using new quasi-resonant ZVS-PWM inverter with power factor correction," IEEE Trans. Ind. Appl., vol. 34, no. 4, pp. 705-712, Aug. 1998. H. Terai, I. Hirota, T. Miyauchi, and H. Omori, "Comparative performance evaluations of IGBTs and MCT in single ended quasi resonant zero voltage soft switching inverter," IEEE 32nd Annual Power Electronics Specialists Conf., Vancouver, 2001, pp. 2178-2182. S. Llorente, F. Monterde, J. M. Burdío, and J. Acero, "A comparative study of resonant inverter topologies used in induction cookers," APEC Seventeenth Annual IEEE Applied Power Electronics Conf. and Exposition, Dallas, 2002. pp. 1168-1174. M. Saoudi, D. Puyal, C. Bernal, D. Anton, and A. Mediano, "Induction cooking systems with single switch inverter using new driving techniques," IEEE Intern. Symposium on Industrial Electronics. Bari, 2010, pp. 878-883. A. Chakraborty, P. K. Sadhu, K. Bhaumik, P. Pal, and N. Pal, "Behaviour of a high frequency parallel quasi resonant inverter fitted induction heater with different switching frequencies," International Journal of Electrical and Computer Engineering (IJECE), vol. 6, no. 2, pp. 447-457, 2016. I.-O. Lee, and J.-Y. Lee, "A High-Power DC-DC Converter Topology for Battery Charging Applications," Energies, vol.10, no. 7, 871, 2017. 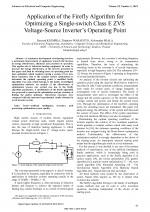 Z. Waradzyn, A. Skala, B. Swiatek, R. Klempka, and R. Kieronski, "ZVS single-switch inverter for induction heating - optimum operation," Prz Elektrotechniczn, 2014, 90(2), pp. 32-35. A. Skala, and Z. Waradzyn, "A single-switch class E voltage-source inverter for induction heating - influence of the parameters of the resonant circuit elements on its performance at optimal control," Prz Elektrotechniczn, vol. 1, no. 1, pp. 33-36, 2017. A. Skala, and Z. Waradzyn, "Determination of efficiency in a single-switch class E ZVS-1S quasi-resonant inverter in application for induction heating," Prz Elektrotechniczn, vol. 1, no.3, pp. 99-102, 2016. J. Kwiecien, and B. Filipowicz, "Comparison of firefly and cockroach algorithms in selected discrete and combinatorial problems," Bull Pol Ac: Tech, vol. 62, no. 4, pp. 797- 804, 2014. R. Klempka, and B. Filipowicz, "Comparison of using the Genetic Algorithm and Cuckoo Search for multi-criteria optimisation with limitation," Turk J Electr Eng Co, vol. 25, pp. 1300-1310, 2017. Y. Huang, C. Yang, and S. Gong, "Energy Optimization for Train Operation Based on an Improved Ant Colony Optimization Methodology," Energies, vol. 9, no. 8, 627, 2016. R. Klempka, "Design of C-type passive filter for arc furnaces," Metalurgija, vol. 56, no. 1-2, pp. 161-163, 2017. M. Huang, "Hybridization of Chaotic Quantum Particle Swarm Optimization with SVR in Electric Demand Forecasting," Energies, vol. 9, no. 6, 426, 2016. S. Vrkalovic, T.-A. Teban and I.-D. Borlea, "Stable Takagi-Sugeno Fuzzy Control Designed by Optimization," International Journal of Artificial Intelligence, vol. 15, no. 2, pp. 17- 29, 2017. R.-E. Precup, M.-C. Sabau, and E. M. Petriu. "Nature-inspired optimal tuning of input membership functions of Takagi-Sugeno-Kang fuzzy models for Anti-lock Braking Systems," Appl. Soft Comput, vol. 27, pp. 575-589, 2015. S. H. E. Abdel Aleem, A. F. Zobaa, and M. E. Balci, "Optimal resonance-free third-order high-pass filters based on minimization of the total cost of the filters using Crow Search Algorithm," Electr Pow Syst Res, vol 151, pp. 381-394, 2017. J. Saadat, P. Moallem and H. Koofigar, Training Echo Estate Neural Network Using Harmony Search Algorithm, International Journal of Artificial Intelligence, vol. 15, no. 1, pp. 163-179, 2017. M. A. Hosen, A. Khosravi, S. Nahavandi and D. Creighton, "Improving the Quality of Prediction Intervals Through Optimal Aggregation," IEEE Transactions on Industrial Electronics, vol. 62, no. 7, pp. 4420-4429, 2015. X. S. Yang, "Firefly algorithm, stochastic test functions and design optimization," Int J of Bio-Inspired Computation, vol. 2, no. 2, pp. 78-84, 2010. 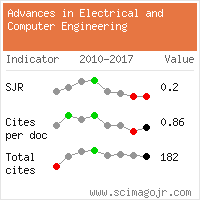 Citations for references updated on 2019-04-22 09:29 in 133 seconds.